All of our gates are custom made. We are happy to look at any designs that you bring in as well as offering photos of gates we have done and designs of gates that we can do. We can build to fit existing pillars, new pillars, or offer steel posts to match the gate. We work with you and will do as little or as much as you want to set up your gate system. 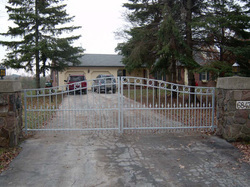 Click to view driveway gates in our Driveway Gates Gallery. 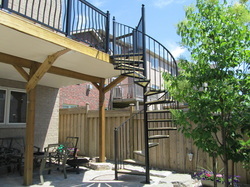 Our spiral stairs are custom made to suit your needs. We build most of our stairs in 4, 5, and 6 foot diameters. However, we will do sizes in between and larger than that. 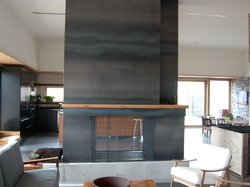 Our stairs can be used for interior and exterior applications. 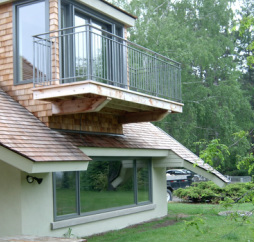 We offer a variety of tread options, railing options, colours, and are able to install. Click to view spiral stairs in our Stair Gallery. Please click the link below to download our printer friendly spiral stair information brochure which lists more information on our stairs. 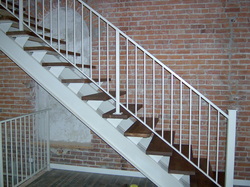 We build custom interior and exterior iron stairs for residential and commercial applications. 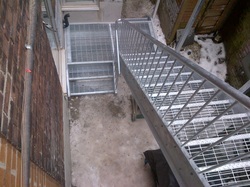 We have built a variety of stairs in the past and are happy to show clients photos of what we have done. We will also look at ideas or drawings which are brought in and offer our expertise to make sure everything is well laid out for a comfortable stair. We build custom interior and exterior railings for residential and commercial applications. We are happy to sit down with our clients and listen to their wants and needs for safety, building code requirements, style, and finish. We offer wrought iron picket railings, glass railings, and mesh railings. The commercial projects we have done include custom works such as interior and exterior railings, stairs, handrails, traffic guards in warehouses for forklifts, sidewalk pipe guard rails, security gates, and garbage enclosure frames. We make all sorts of custom, one of a kind projects for our clients. We have fabricated ideas like a raw steel cladded fireplace, steel cabinetry, a driveway gate from a pickup truck frame, and furniture. We are happy to take a look at any idea you have.